Pet Care large dogs Yorkshire Terriers Yorkshire Terriers Do Yorkshire Terriers Make Good Pets? Some people prefer large dogs, the type that bound around and leap up high to catch Frisbees and frighten potential burglars into trying their luck elsewhere. Other people prefer little dogs, the type that like to sit on laps, take little walks around the park and make little yapping noises to greet the postman. If you are one of the latter people, then you might be interested in searching for Yorkshire Terriers for sale in your local area. Yorkshire Terriers are smaller than many cats and have long, silky hair and make great pets whether you have a grown up household or have young children in your family. They were popular in Victorian times and again in the trenches during the First World War as a breed that was good at catching rats: they have quick reflexes, can get into surprisingly small spaces and have sharp little teeth close to the front of their muzzles. Now, they are popular in houses where space is restricted or with owners who are not as mobile as others and who want a dog that needs only short walks. They need regular grooming because of their long hair, which can quickly become tangled and full of burrs and mud if left unattended. That same hair, though, is usually very good for people who are prone to allergies, since there is little dander and shedding compared to other breeds. If you have a Yorkshire terrier in your home you will always know when someone is coming to visit, or just walking past your house. Excessive barking can be a problem with this breed, but is something that can be trained out if it is acted upon early and thoroughly. Many Yorkshire Terriers (and staffy dogs) end up in the care of the RSPCA after owners find that their dog yaps too much and is annoying the neighbours. If you want a Yorkshire Terrier, make some enquiries with your local RSPCA branch as you could easily find the dog of your dreams in their care (at a fraction of the price you would pay to a breeder, and with full knowledge of the dog’s temperament and health). If you buy a Yorkshire terrier, it is vital to be sure that it has been properly socialised and that, if you have young children, it has been raised to be familiar with children. 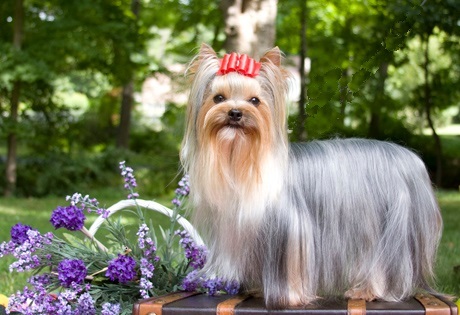 If not, Yorkshire Terriers can be aggressive towards strangers and snap at children if they are frightened or startled. Adopting a Yorkshire terrier, on the other hand, would ensure that the staff at the shelter would point you towards particular dogs that were known to be good with children and friendly. Staff at a shelter are more interested in finding a successful home for the dogs in their care – you can never be sure of the motives of a breeder in selling you a dog.